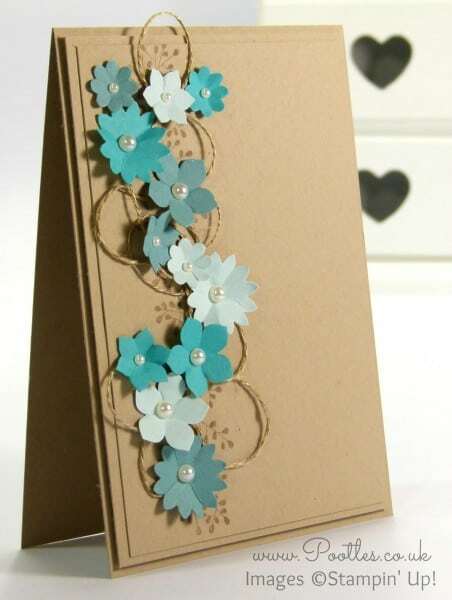 I love a good scattering of flowers on a card, so when I carried on with the theme started yesterday of using products from the Annual Catalogue, I pulled on the loveliness of the Garden Party stamp set for the background and the Boho Blossoms Punch for the flowers. Can you see it in there? Tone on tone, I stamped Crumb Cake ink onto Crumb Cake cardstock (triple layered) to have a base. I then put half a dozen mini glue dots down the length of the stamped image and looped Linen Thread with abandon! 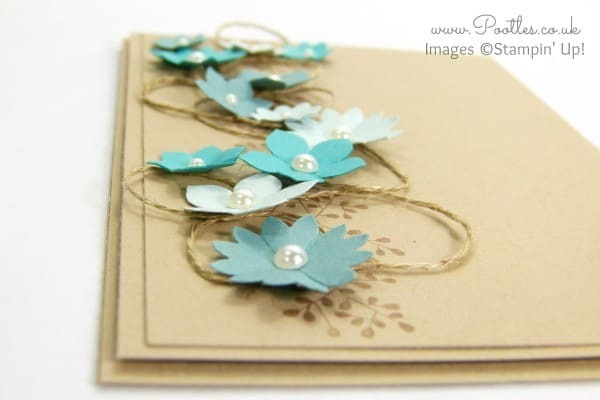 After that, I grabbed 3 different cardstocks – Lost Lagoon, Soft Sky and Bermuda Bay, and punched each once using the Boho Blossoms and Petite Petals punches. I love those 2 together and it gave me a dozen flowers to play with. This is one of those ‘just because’ cards. The ones that say, ‘Hi, how are you?’ and just mean a lot. I hope you’re making those kinds too, as they’re some of the best to send.